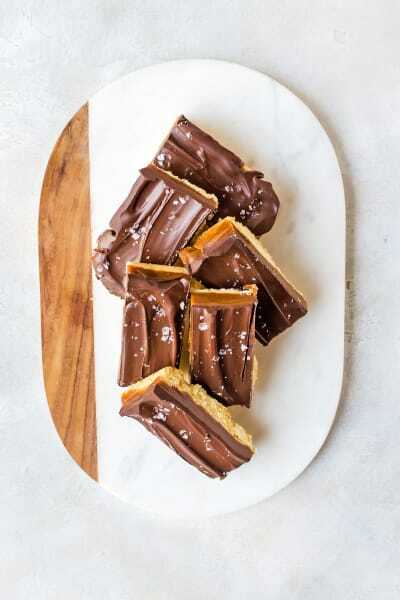 Homemade Twix candy bars. 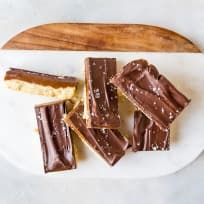 A crisp, buttery shortbread is topped with salty caramel and covered with dark chocolate for a delicious treat everyone will love. If I had to pick one candy as my favorite, Twix bars would rank very high on that list. I think it would be a tie between Twix and gummies, and everything else kinda just falls to the wayside for me. My favorite way to eat a Twix is to freeze it and then eat the frozen cookie part off before eating the chocolate and caramel. Sometimes I’ll mix it up and eat the caramel first, depending on how frozen it gets. 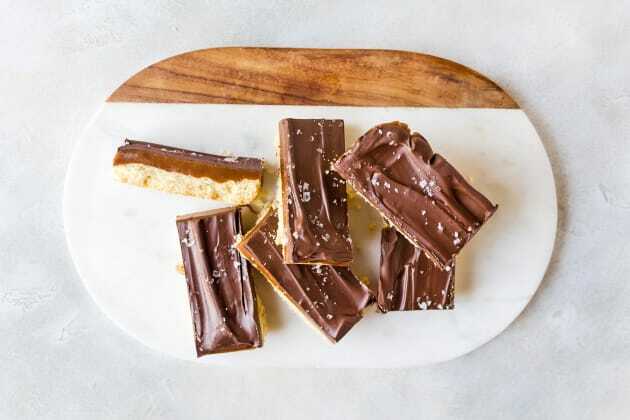 Homemade Twix bars are infinitely better than what you get at the store, if I am honest with you. It isn’t much of a surprise, I know, but I feel the need to emphasize that fact for you now. The shortbread is so nice and buttery. Do yourself a favor and splurge on some fancy butter for the shortbread. Then the caramel. Oh, the caramel. I will choose homemade caramel over anything you buy any day. There is so much more depth to the flavor and with a light sprinkling of salt, it suddenly gets about a million times better. 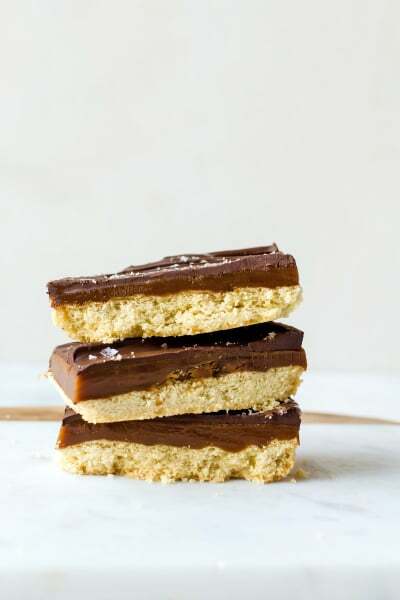 Since the prospect of individually carameling and chocolating (yes, those are words… now) each portion of shortbread is just too much to bear, we are making our homemade twix into bars. 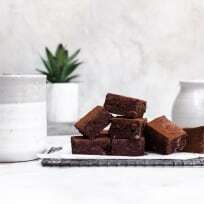 There are a few tips to making these bars incredible and easier to handle. First, a lot of recipes tell you to leave the shortbread whole until you are ready to cut out the finished bars. I find that leaves you with a shortbread that can break off unevenly. I recommend cutting the shortbread while it is still warm, but not taking it out of the pan. 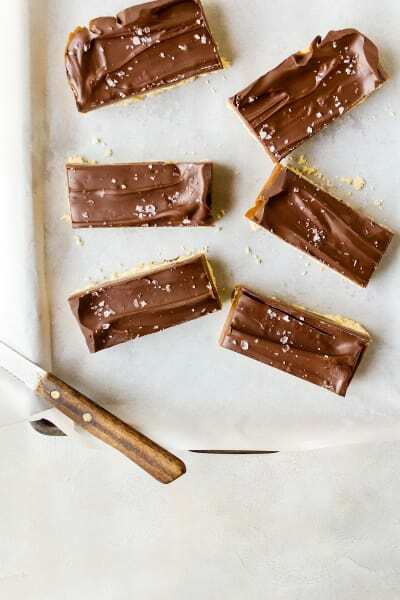 Leave the cut shortbread to cool right in your pan. I also recommend using a candy thermometer when making the caramel. It’s not 100% necessary, but makes your life easier. A thermometer also means you get to make many other tasty treats that do require a thermometer. Another word on the caramel: use a large, heavy bottomed pot to make the caramel. The caramel bubbles a lot and you will need a larger pot than you may think. Trust me and my messy stove on this one. Preheat the oven to 350°F. 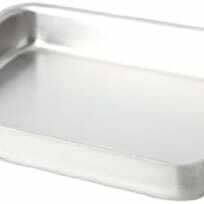 Line an 8x8 baking pan with parchment paper. Set aside. 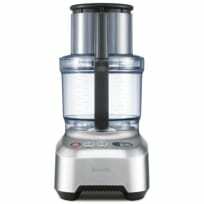 Add all the ingredients together in a food processor and pulse to combine. The mixture should look like large crumbs. 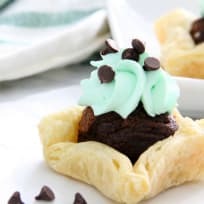 Pour the ingredients into your baking pan and press down firmly. Prick the dough several times. Bake for 35 – 40 minutes, or until the top is a light golden brown. Allow to cool five minutes, then cut into bars without removing the shortbread from the pan. Set aside. 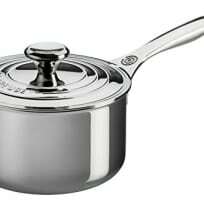 In a very large, heavy-bottomed saucepan, add the sugar, corn syrup, heavy cream, and salt. Stir to combine. Heat the pan to medium high and leave to cook without stirring. Lightly wet a pastry bush and clean the sides of the pan as needed. Continue to heat until the mixture caramelizes and reaches 248 degrees F, about 8 – 10 minutes. The mixture bubbles over significantly, so be careful! 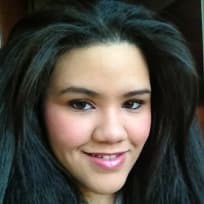 Once the caramel reaches the right temperature, remove from heat and stir in the vanilla and butter. Pour the caramel over the shortbread and spread out to the sides. Allow the caramel to cool. 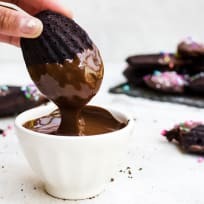 Melt the chocolate over a double boiler and stir in the coconut oil. 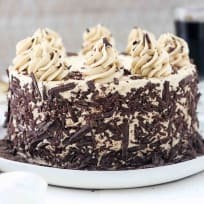 Pour the chocolate over the cooled caramel and spread. Chill the bars until the chocolate is hardened, then cut through the caramel and chocolate over your original cuts for the bars.